I have been getting quite a few people in the salon recently noticing the shift in their skin now that the weather has eased. My ‘go to’ product hashoc 2 always been Environ Intensive Hydrating Oil Capsules. 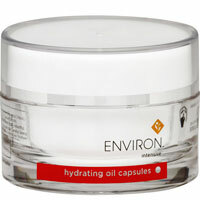 Environ Intensive Hydrating Oil Capsules is an easily absorbed oil formula containing a powerful mixture of Retinol and vitamins C and E. It energises and hydrates the skin, promoting the production of healthy collagen and elastin. It contains green tea extract, one of the most powerful antioxidants available, and lipochromalin, a form of vitamin E with powerful antioxidant properties and a scavenger of nitrogen free radicals. It assists in preventing skin cell damage. Designed for all skin types, especially dry or delicate skin, it is an excellent winter skin treatment.